The Internet of things is the next big thing in the near feature. This technology is growing fast, and there are many objects talking to each other using the internet. Prototyping platforms like Arduino and Raspberry PI are supporting these innovations and helping many developers create interesting IoT projects. One pillar of this emerging technology is the cloud IoT platforms that help developers to build Internet of things projects. One great platform, that is very useful, to build great IoT projects is Temboo. To explore the powerful features of Temboo, we will connect an Arduino with an Ethernet shield to Yahoo! Weather. Using this information, the Arduino controls an RGB LED, changing its color. 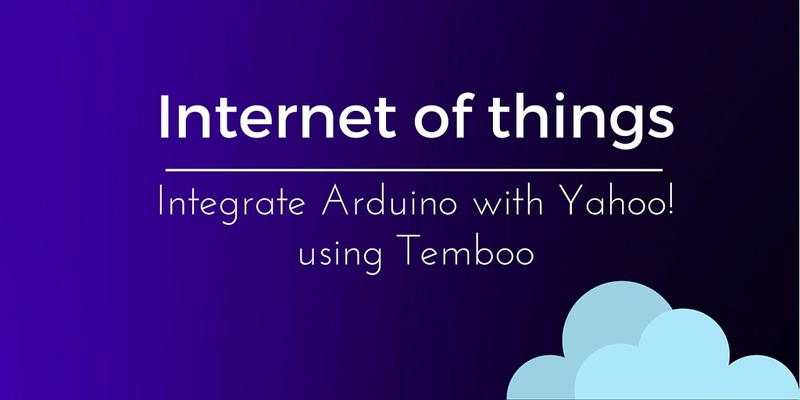 In previous IoT projects, we explored how external events, measured by sensors connected to an Arduino, can trigger actions on theTemboo platform, like sending messages and so on. In this project, a different approach is used: data retrieved from an external source (like Yahoo! Weather) can control and have effects on Arduino connected devices. The code is very simple. Arduino has some PWM pins that can be used for this purpose, in this sketch the PWM pins used are 3, 6, and 5. If you are new to Yahoo! Weather, you have to know that to get weather information, Yahoo uses Woeid. This is a unique identifier assigned to all cities and areas around the world. 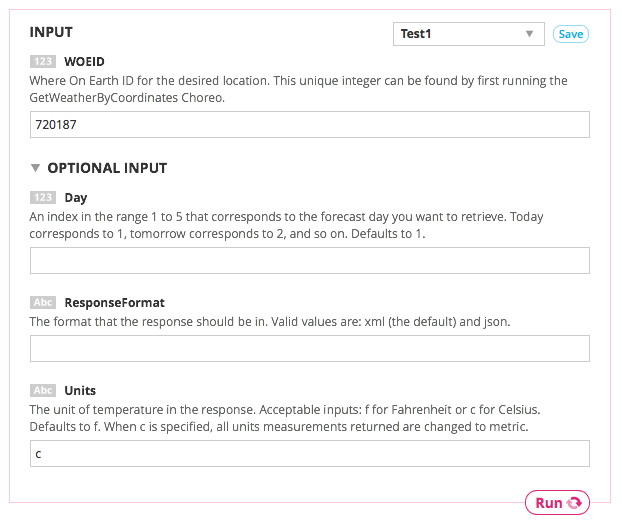 Using this parameter, it is possible to get weather information. As you will see later, Temboo requires Woeid so that it is necessary to convert the city name to woeid. There are two different methods: one that uses the Yahoo! API and another one that's much simpler. This method requires you to create an account on Yahoo! and create a unique key. This can be done easily using Yahoo! developer site. The wooed (720187) is on the top so that it is enough to copy and paste this value. Inserting the city name and clicking on lookup you will find your result. 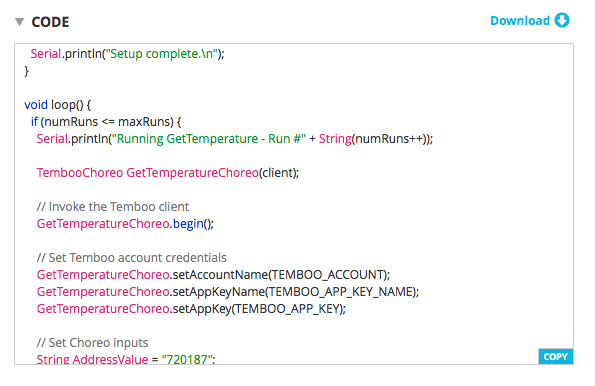 Temboo is a great platform that uses Choreos to expose services to Arduino or other dev platforms. To get Weather information we have to use Yahoo! Weather Choreos and then GetTemperature. In this case, the project uses Temperature to control the RGB Led, but you can use any other parameters. Now everything is very simple, just paste the woeid you got before and click on run to get weather information. In this example woeid is used but you can get the weather information using Address, for example. However, I prefer woeid as it is much simpler. Now that we have all the pieces in our hands we have to mix them to make things working. The sketch with Temboo code, copied previously, has to be modified so that the result returned is used to change the RGB Led color. Notice that there is the need to clean up the line before converting it to an integer. They are just a simple set of rules, of course you can change them as you prefer. In this Internet of things project we connected an Arduino to Yahoo! Weather using Temboo choreos. 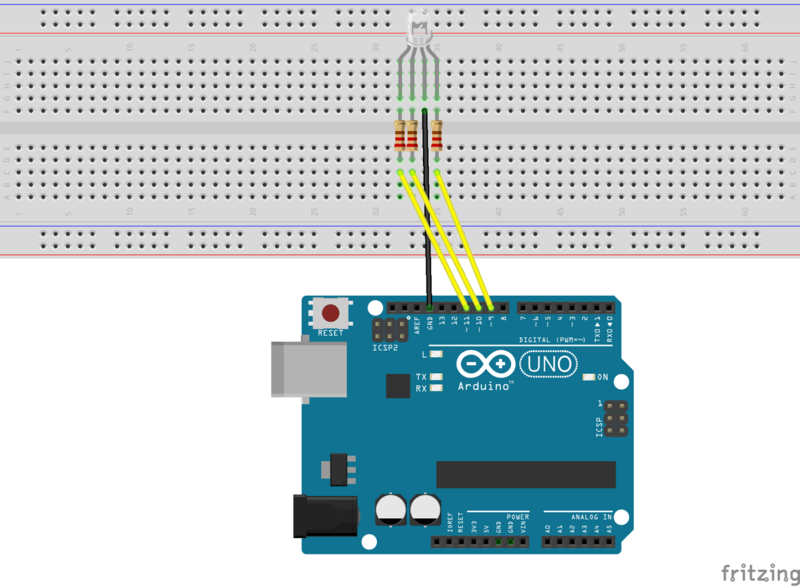 Arduino, with the information retrieved, controls an RGB LED.